(Nanowerk Spotlight) The challenges in transportation security, most notably air transport, evolve around detecting explosives before they reach their target, i.e. get on a plane for instance. The two technology-based methods of explosive detection are either nuclear-based (probing the screened object with highly penetrating radiation) or rely on trace detection. Trace detection techniques use separation and detection technologies, such as mass spectrometry, gas chromatography, chemical luminescence, or ion mobility spectrometry, to measure the chemical properties of vapor or particulate matter collected from passengers or luggage. All these methods require bulky and expensive equipment, costing hundreds of thousands of dollars apiece. This results in a situation where the effort and technology involved in the detection of explosives are orders of magnitude more expensive than the effort and costs incurred by terrorists in their deployment. Today, the cheapest, very reliable, and most mobile form of explosive detection is decidedly low-tech - dogs. The olfactory ability of dogs is sensitive enough to detect trace amounts of many compounds, which makes them very effective in screening objects. A dog can search an entire airport in a couple of hours. Using a chemical analysis machine would mean wiping down nearly every surface in the airport with a sterile cotton pad, then sticking those pads, one by one, into a computer for analysis. Given the recent advances of nanotechnology, researchers are now trying to develop the next generation of explosives sensors that are accurate, fast, portable and inexpensive – and don't need to be fed. In contrast to the currently used machines, dogs have the advantage of being relatively uncomplicated. "The [chemical analysis machines] that are used as an alternative to dogs are just extremely, unbelievably advanced and complex," says Rick Charles, an expert on aviation security at Georgia State University. "They involve things like ion mobility spectrometry – processes that literally do a molecular analysis of the contents of the container." 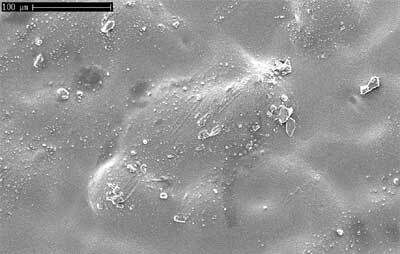 SEM image of floppy diskette with traces of C-4 explosive	(Source: Materials Challenges in Transportation Security, Transportations Security Administration). The challenge of detecting explosives on people or objects is considerable: often there are only minute quantities available; there is a broad range of effective explosives that need to be screened for; all current detection technologies, including dogs, require close proximity to the person, package, or vehicle being screened. Among the major detection techniques, trace detection suffers from the fact that available vapor plumes are normally too dilute for detection at a distance. Another major drawback is that current explosives sensors are bulky and expensive and cannot be miniaturized (think of the screening gates at airports). Furthermore, the effectiveness of chemical trace analysis is highly dependent on three distinct steps: (1) sample collection, (2) sample analysis, and (3) comparison of results with known standards. If any of these steps is suboptimal, the test may fail to detect explosives that are present. These issues set the parameters for the design and development of nanotechnology-based, next generation bomb sniffing equipment. The goal in developing nanotechnology enabled sensors is to achieve reliable, extremely sensitive and inexpensive sensors (at least a thousand times cheaper than today's equipment) that can be mass produced and deployed in large enough numbers so that the cost of detection by law enforcement will be less than the cost of deployment by terrorists. One example of a next-generation nanotechnology explosives detector is a nanocomposite film that shows very fast fluorescence response to trace vapors of explosives such as TNT, DNT or NB. Developed by researchers in China, a silica film doped with nitrogen-containing macrocyclic molecules - porphyrins - shows a fluorescent response to even trace levels of explosives such as TNT ("Metalloporphyrins as sensing elements for the rapid detection of trace TNT vapor"). "Since the preparation is very easy, the used materials are inexpensive, organic sensing elements become stable enough in the inorganic matrix, and the synthesized sensing films are easily incorporated into inexpensive and portable electronic devices, this explored method should be a promising alternative to other developed explosive detection methods" says Guangtao Li from the Key Laboratory of Organic Optoelectronics & Molecular Engineering of the Ministry of Education at Tsinghua University, Beijing. Another chemical sensor approach is based on carbon nanotubes (CNTs). Developed at the NASA Ames Research Center, this platform provides an array of sensing elements where each sensor in the array consists of a CNT and an interdigitated electrode as a transducer. Due to the interaction between nanotube devices and gas molecules, the electron configuration is changed in the nanostructured sensing device, therefore, the changes in the electronic signal such as current or voltage can be observed. By measuring the conductivity change of the CNT device, the concentration of the chemical species, such as a certain type of molecule, can be measured. Combined with MEMS technology, light weight and compact size sensors can be made in wafer scale with low cost. This nanosensor technology can extend its application in civilian areas such as explosives detection, monitoring filter bed breakthroughs, personnel badge detectors, embedded suit hermiticity sensors, and other applications. Additionally, a wireless capability with the sensor chip can be used for networked mobile and fixed-site detection and warning systems for military bases, facilities and battlefield areas.